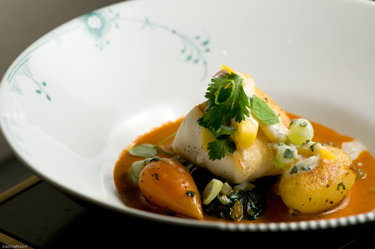 L'Espalier is often credited with being the first independently owned restaurant to bring haute cuisine to Boston, not to mention doing so with a trailblazing commitment to using local, fresh ingredients from New England. Located on Boylston Street when it opened in 1978, L'Espalier moved to a historic Back Bay townhouse in 1982, only to return to Boylston Street in 2008 where it currently resides adjacent to the Mandarin Oriental Hotel. Under Chef, Proprietor, Author and now Farmer Frank McClelland's stewardship, L'Espalier has consistently been rated at the top of national and local best restaurant lists (Zagat, Boston Magazine, Frommer's Travel Guide and Wine Spectator among them). The restaurant has received numerous accolades including the Distinguished Restaurant Award from Mimi Sheraton, as well as being the first New England restaurant to receive Four Stars from The Boston Globe food critic, Alison Arnett. In 1996 Nation's Restaurant News bestowed L'Espalier with its highest honor, inducting the restaurant into its Fine Dining Hall of Fame. L'Espalier is the only independent restaurant in New England to receive eleven consecutive AAA Five Diamond Awards (the only Boston restaurant with this distinction) and also has earned twelve consecutive Mobil (now Forbes) Four-Star Awards.